Such hiccups have never stopped The Intelligence from rolling right along however, as the release of their new LP Males showcases. Put out by In The Red Records, Males is their 7th album proper since their inception in 1999 (if you count Let's Toil, which is debatable, but I do), and it is an album recorded with a full band in tow. 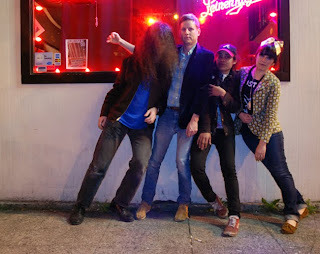 I dont think it is a lick on previous effort Fake Surfers, which is amazing and you should check it out RIGHT NOW, but the track below is a great snapshot of Finberg's biting lyrics (a la Mark E Smith at times...) and the down n dirty approach to grinding out a garage rock tune. I also think that whilst Males is a little bit of a downturn for them, their next output (if they stick together) could be their best thing yet - new band members include past members of Eat Skull and Karate Party. The Intelligence are romping around the US on a month long tour now, so catch them if you can.